Just because summer is in the rear view mirror doesn't mean that your ice cream consumption has to slow down! I am firmly in the frozen-desserts-all-year camp, especially when there's an opportunity to try a new brand of dairy-free desserts. During my brief visit to Atlanta a couple weeks ago, I stopped by the fun and funky Westside Provisions development in Midtown for dinner with a friend. Because I arrived earlier than our scheduled meeting, I walked around the stores and came across Jeni's Splendid Ice Creams, a company whose dairy-full pints I have seen at my local Whole Foods, but I have never stopped by a scoop shop. I quickly spotted dairy-free options on the menu both in sorbet and non-dairy ice cream varieties so it wasn't difficult to make an executive decision to eat dessert first for the sake of a review! With any ice cream parlor, there's of course a risk of cross contamination. 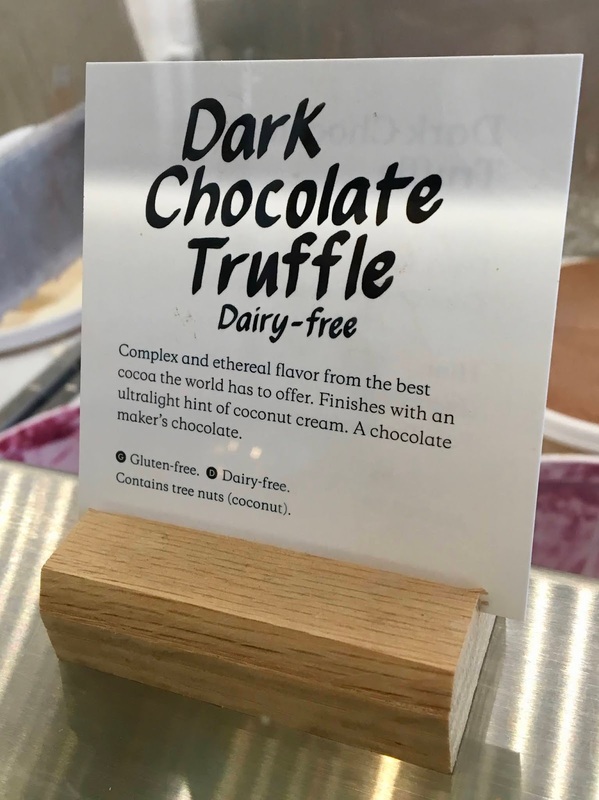 They do make gluten and dairy-containing ice creams, and their kitchens do handle eggs, peanuts, tree nuts, and soy. 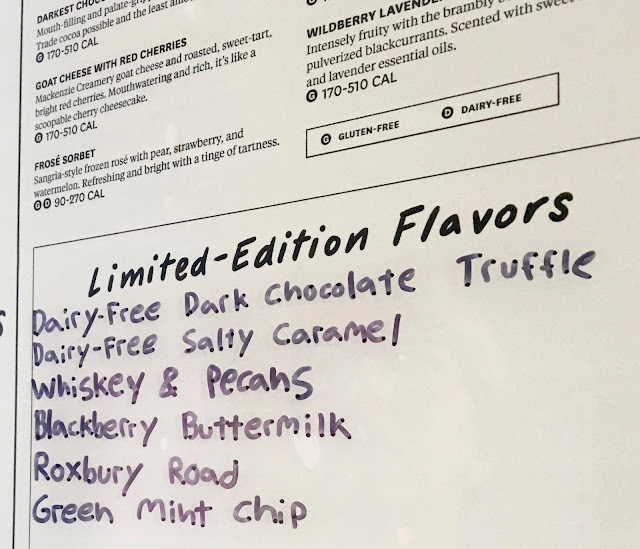 On production days, they do follow manufacturing best practices and produce ice cream in order of the least number of allergens to the most so that cross contamination is minimized. They also wash, rinse, and sanitize equipment after every flavor. Luckily for allergy diners, labeling for gluten and dairy-free items is clear on the menu. Be sure though, that you request your frozen dessert without a waffle cone "chip" that comes on standard scoops. I asked that they use clean scoops to scoop out my ice cream, and the staff happily accommodated my request. 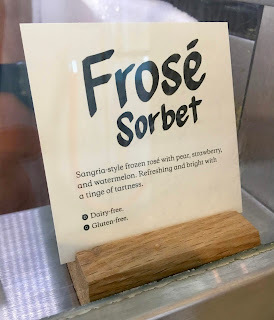 The day I visited, the gluten and dairy-free options available were their frosé and riesling poached pear sorbets as well as dark chocolate truffle and salty caramel coconut milk ice creams. All flavors were gluten and dairy-free. Click here to see a full flavor and ingredient listing for all of Jeni's concoctions. 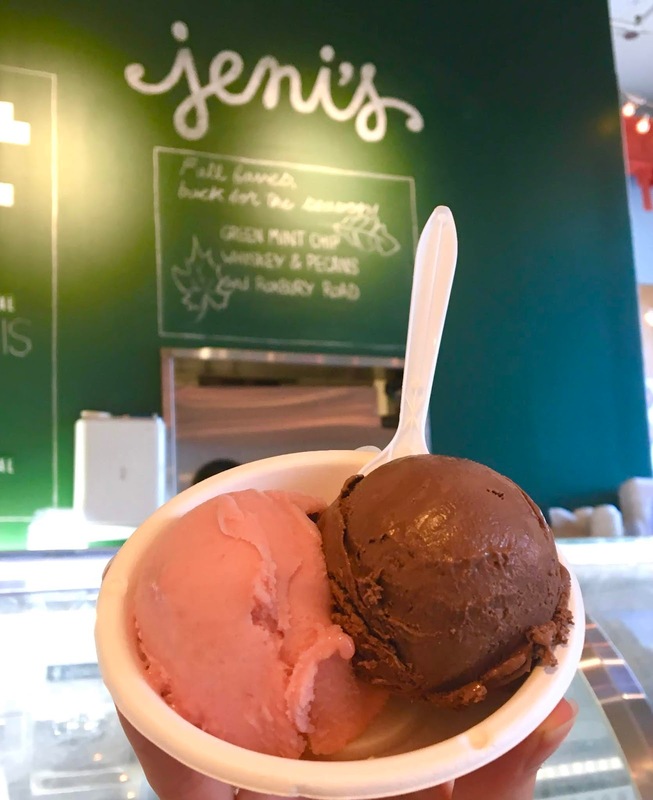 After sampling all four flavors, my decision came down to the fruity frosé and the rich dark chocolate truffle... so I decided to order a scoop of both! The frosé channels sunny afternoons and sunny skies with it's sangria-like flavor with a kaleidoscope of fruity flavors dancing about. I loved the lightness of the sorbet- it ways playful and refreshing, perfect for the late-afternoon heat. In contrast, the dark chocolate truffle provided a decadence factor that complemented the sorbet. Each spoonful was melt-in-your mouth creamy and packed a punch that any chocolate-lover would swoon over. Together, the ice cream and sorbet brought out the best of each other and made for a dream duo. I am so glad I decided to break norms and eat dessert first! 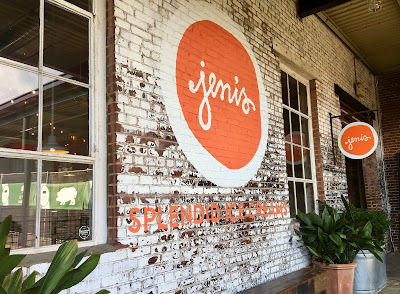 It's really difficult to impress me with dairy-free ice cream and sorbet because there's just so many mediocre offerings out there so I am happy to report that Jeni's earned top marks from me for creative flavors and spot-on textures. I definitely will seek out their DC scoop shop closer to home, and look forward to indulging in the near future.